This starts with the group watching a video and they want to watch it a second time. After the video they all give each other a group hug. Smurmy murmy comes with with the mail and then we go to a flashback of the morning when they talk about the fan letter they wrote. Arty Smarty Pants gets the fan letter and it thanks him from Lionel and Leona for letting them dance in his “Dance in Smarty Pants Video”. Arty says the letter is a blast, fantastic, bombastic and he is gymnastic. Right after this, Mr. Smarty Pants falls. Back to present time, we see the group talking about a great idea to another flashback where Arty talks more about the fantastic fan letter and how he wants their parents to dance in his next video. Lionel and Leona realize that their parents don’t know how to Dance in Smarty Pants and decide to teach them. Busterfield III is teaching pigeons how to Dance in Smarty Pants. Then we go to a side skit talking about the a sound in the word pants. Gawain’s Word is next where we see Sir F and Sir An jousting. Together, we see that the names equal Fan! So, Gawain’s Word was Fan! Marmy’s Poetry Corner has Marmy with Al Franken who reads A Funny Word, by Norman Styles. It is about two words, under pants. He describes how the two words together makes him laugh, underpants. Slant is sounded out and described by Fred Newman and he tilts so much that he falls! Then Lionel and Leona try to teach their parents how to Dance in Smarty Pants. The Stanispantski Method is used to teach them. Going through the method, the first step is to put on the Smarty Pants and their parents joke around and put them on their heads! Then their parents actually do pretty well, doing the rubber stampy dance. Lionel is mad but Leona likes how they dance. He doesn’t want them to have fun because they don’t have time for that. So he begs them to learn how to Dance in Smarty Pants. Lionel’s mother tells him that Arty Smarty Pants is there and she tells him to ask Arty if he doesn’t want them to have fun while they dance. 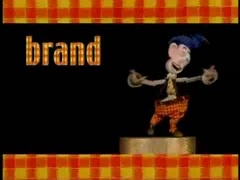 Fred starts to sing the Zappity zap zabb song. It’s about getting your mouth moving and dancing. We see a preview for a movie next, which is about The Sad Dad. Many references to the letter a sound as in bAd and cAt. The dAd is glAd! Tiger Words is next and if he makes a stack, he wins a stack of flapjacks. So Tiger writes st and ck but he puts a i in between it, making the word stick instead of stack! Then he pulls out a pink eraser and erases the i and he puts an a making the word STACK! So he wins the stack of flapjacks. Cooking with Cleo and Theo is next. They are making a Tackled and Packled Hamburger. Theo tackles the hamburger and flattens it. He puts the tackled hamburger in a pan and we go back to the main story. Lionel is looking for Arty Smarty Pants and his parents show him that Arty is in a book. Arty wrote the book and it is about a king that told everyone that they are not allowed to have any fun. No fun doing any work at all, building carts, making art, or anything. One day, Sir Arty Smarty Pants comes and is ordered to not dance because dancing is fun. Sir Arty showed the king the dance he was not going to do and everyone started dancing while they were working. They had a lot of fun doing this and the king saw that everyone was more productive while having fun when they worked, so he changed the law to have fun while you work! Lionel realizes his mistake and encourages everyone to have fun while they learn how to Dance in Smarty Pants. An Arty video comes on and and we see different ways to Dance in Smarty Pants. We see many people dancing in smarty pants. Lionel writes Arty another note and thanks him for putting their parents in his video. Today, i found a site called My Sims Wiki. I really love it, as i love the MYSims! This sitte has deatils on the games and charectors, as well as other stuff. you will really like it! “I hope”! So anyway, i give this 5 thumbs up, if you know what I mean! i found out some facts about some Mysims i didn’t know about before. i also enjoyed reading transscrpits on my sim shows. I’m so glad i found this site, and i will do it almost every day! In fact, i’ll do it tomorrow morning! I really can’t wait to do it! I will have tons of fun with it! and fianlly, i’ll act out the scripts with a freind, or make my own! One morning, the Health Inspector comes to the Krusty Krab. He asks for one of everything on the menu, and after that, he say he just needs a plain Krabby Patty. But then on tv, a news flash comes on, saying that a guy is posing as a health inspector. Mr. Krabs is furious, and thinks that the real inspecotr is the impostor, so he adds revolting stuff to the Krabby Patty. Before the inspector can take a bite, he acidently chokes on a fly and knocks himself out. Spongebob and Krabs think he’s dead and burry him. But then the police come and While stalling them, the health inspector it starts to rain, and the inspector slides down the hill. the police bring Spongebob and Krabs back to the Krusty Krab, and Krabs tells Spongebob to hide the inspector in the freezer. But the back door is locked, so Spongebob hides the inspector in his hat and hides it in the freezer. The female ploice officer asks for ice in her soda but Mr. Krabs tries to stall her. Finally Mr. LKrabs confesses, but the inspector is not in the freezer. The police thinks the inspector turned into a zombie, but when he comes all dirty and tatterd, the police knock him out, and realize he’s just a plain old health inspector. In the end, The inspector passes the Krusty Krab for the fear of getting hit on the head again. this episode is about Spongebob getting the suds. Plot: Spongebob wakes up one night hungry, so he makes himslef a seanut butter and Jellyfish Jelly sandwich. After one bite he instantly falls alseep. However, he leaves the fridge door open, and by the next day, Spongebob’s house and everything in it is frozen solid. When Spongebob wakes up, he’s sick and has the suds, which causes Bubbles to shoot out of him everytime he sneezes. Spongebob tries to go to work, but when Mr. Krabs finds out he’s sick, he sends him home. SPongebob calls Sandy and asks if she can take him to the doctor. Sandy agrees. Patrick asks Spongebob where he’s going, and Spongebob tells him he’s going to the doctor. Patrick is horrified and tells Spongebob how horrible the waiting room and magizines are. Now scared to go, Spongebob asks if Partrick will be his doctor. Patrick complies. Patrick tries to cure Spongebob by plugging his holes with corks. When Spongebob sneezes, he blows up. Thinking the treatment is working, Spongebob tries to call Sandy to not to come, but his fingers are too big for the buttons. Patrick calls her, and Sandy tells him he’s not a doctor, and that she’s still coming. Patrick tries to cure Spongebob by doing ridiculaous things, such as pulling one of his teeth out and putting a Seanut butter sandwich on his foot. When Patrick realizes that Sandy is here, he tries to hids SPongebob by disgusing him as a rock, but he is revaled. Patrick and Sandy then start fighting over Spongebob, and in the struggle, he is set loose. Spongebob then rolls down a hill to the Krusty Krab and Sneezes a big sneeze, destroying it and returns to normal size. At the hospital Spongebob gets the Sponge treatment and gets better and even gets a lolipop. Jelous, Patrick pretends to have the suds, but is subjected to painful treatments for impersenating a doctor. 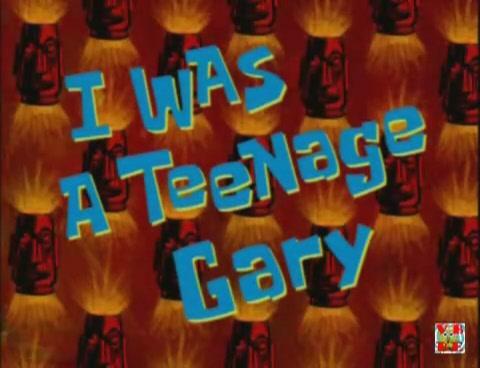 I Was A Teenage Gary. This is about Spongebob acccidently turning into a snail. PLOT: After playing with Gary, PAtrick comes, saying the the annual jellyfish convention in Ukelee is this weekend! Spongebob says he can’t go, because he dosn’t have anyone to take care of Gary. Spongebob decides to ask Sqidward. At first, Sqidward says no, but after he relizes that Spongebob and Patrick are going away for the weekend, he agrees to do so. But when spongeob is giving instructions on how to take care of Gary, Sqid is’nt really listening. After spongebob leaves, Sqidward forgets to feed Gay, because he was too bsuy relaxing. after spongebob returns, Sqid realizes he forgot to feed Gary! Sqid feeds Gary all the morning cans but gary isn’y respoinsive. When Spongeob sees Gary, he is horrified, so he calls the doctor. The doctor gives spongebbo Snial Plasma to give Gary. But he’s too afraid, so he asks Sqid to do it, But he accidently injects Sponegob with the plasma. that night, Spongebob opens a can of night food for Gary, But somehow eats it all! then He burps and meows! Then his movement, ” and voice,” slows down. Then his eyes strech out like a snails! he then loses his arms and feet, and his pants become a sort of shell. Now Spongebob is a snail! Then Sqid sees the transfomed spongebob and freaks! Spongesanil chases him through his house, wrecking it. In the end, Sqid also recieves the plasma and becomes a snail too. in the end as all three snails sing, Patrick throws a shoe at sqidsnail. When Squidward loks at Spongebob dancing was funny. So was when Squidward is bounceing with Spongebob’s boots. 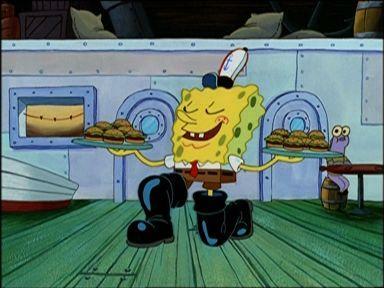 When he’s demonstrating what he can do with the boots made me laugh. When Mr. Krabs was halucinating. The jungle pants scene was good. How he plays when he did the flipbook. 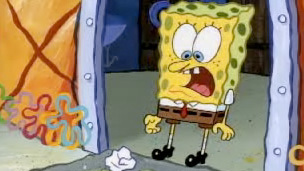 It was funny when Spongebob played the paper like the instroment. When sqidward gave him his house. When sqidward was naked.